Finding dependable lighting in a blackout situation is no longer a problem. 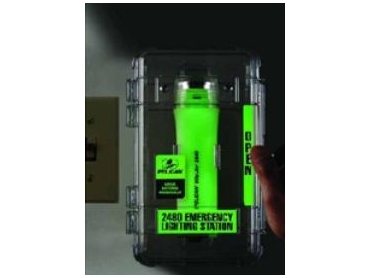 Australian Consolidated Products offers glow in the dark torch for emergency and black out situations. The 2480 ELS houses the MityLite 2440PL (with a photoluminescent body that emits a bright glow in the dark). Use the bright 5-LED array to light your way to safety, powered by alkaline/titanium batteries that provide extended burn time and long shelf life. The strong polycarbonate case, with photoluminescent labels that are visible from a long distance, can be mounted on any surface. The tail switch allows for easy one-hand operation and instant light to find your way to safety.